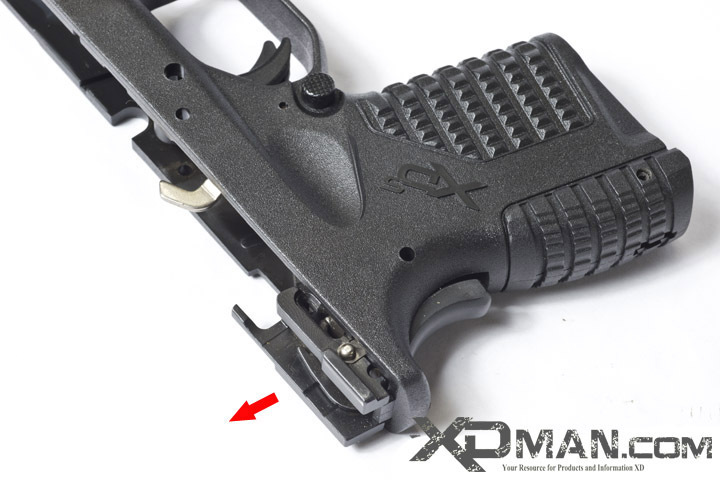 This is part 5 of a 6 part article series focusing on the complete 100% detail disassembly of the Springfield Armory XDS pistol. If you can not easily find the other sections use our search icon on the top right of the website. Type in "XDS Detail Disassembly" and we will provide you with the complete series. Start the frame disassembly by rotating the disassembly lever to the 10:30 - 11 o'clock position as represented by the above red line. At the same time pull the disassembly lever up and out of the frame. Continue turning the lever as you also pull it completely out of the frame. Next knock out the trigger pin as shown by the red arrow far left. This pin can be tapped out from either direction. Use a punch to tap the trigger pin out of the frame. Notice that the pin has a detent on both ends. This detent is held by the slide stop lever spring. When you reassemble push the pin in until you hear/feel the snap of the spring hitting the detent on the pin. Next remove the locking block pin as shown by the left red arrow. This pin can be tapped out from either direction. Use your punch and remove the pin from the frame. Note the right blue arrow shows that the locking block pin has detents on both ends. The slide stop lever spring rides in this detent to hold the pin in place. When you reassemble push the pin in until you hear/feel the spring hit the detent. After you have removed both the trigger and locking block pins, you can pull up on the locking block. The locking block will have some resistance so you can wiggle it as you pull on it to make the job easier. Take note of the slide stop spring that is installed on the locking block. Once the locking block is removed from the frame you can pull the slide stop lever out of the frame. Next remove the magazine blocking lever as shown by the center red arrow. Simply pull the magazine blocking lever up and out of the frame. Moving on to the back end of the frame locate the backstrap roll pin as shown by the left red arrow. Use your punch and tap this roll pin out of the frame. It can be tapped out from either side of the frame. It does not matter which direction you remove this roll pin from the frame. This roll pin is the same as the roll pin located lower on the pistol grip that holds the backstraps in place. Now that the backstrap roll pin has been removed the complete sear housing and trigger assemblies can be removed from the frame. Pull them up and out of the frame as shown by the red arrows above. A close up view of the magazine catch assembly. Please take note of the cutout on the frame for one leg of the magazine catch spring to rest in as shown by the above blue arrow. To remove the magazine catch assembly start by locating the magazine catch pin as shown by the above left red arrow. This pin can be removed in either direction. Use your punch to tap it out. As soon as you remove the pin and punch, the parts will fall out of the frame. Use your hand to cup the top of the frame. Otherwise the spring will want to fly out and get lost. To remove the backstrap locate the backstrap roll pin holding it in place above left. Use your punch and tap it out of the frame. This roll pin can be removed from either direction. The stripped XDS frame shown with both sized backstraps installed. Continue on to part 6 of this series to detail disassemble the sear and trigger assemblies.